Has Samsung finally developed an iPhone killer? We compare the Samsung Galaxy S4 to the iPhone 5. Editor's Note: Check out our recent two part series comparing the Samsung Galaxy S4 and the HTC One – Part 1 and Part 2. When it comes to the mobile market, there seems to be an eternal competition between Apple and Samsung. Ever since the original Galaxy S smartphone emerged, the two companies have been relentless in their pursuit of becoming the most successful smartphone manufacturer. This year will be no different, and although Samsung benefits from having recently unveiled the Galaxy S4, Apple's iPhone 5 still is one of the most sought-after devices. Rumors suggest that the company headquartered in Cupertino is working on both an iPhone 5 refresh (the iPhone 5S), as well as a next-gen iPhone 6. Nonetheless, until these rumors become a reality, the iPhone 5 remains Apple's flagship phone. As such, it's only natural to see how it fares against its archenemy – the Samsung Galaxy S4. In part one of The Diplomat's iPhone 5 vs. Samsung Galaxy S4 miniseries, the focus will be on these two smartphones' hardware specs. Does the iPhone 5 manage to keep up? A smartphone's display is obviously one of its most important characteristics, mainly because it not only serves as a screen, but also as an input method. When you compare the iPhone 5 with the Samsung Galaxy S4 you can easily notice a huge difference in the design philosophies employed by the two manufacturers. The iPhone 5 offers a 4.0-inch LED-backlit ISP LCD panel featuring a resolution of 640 x 1136. If you do the math, this results in a pixel density of 326 pixels per inch. On the other hand, the Samsung Galaxy S4 delivers a pretty large 5.0-inch Super AMOLED display with a full HD resolution (1080 x 1920) and a pixel density of 441 ppi. In a way, the SGS4 offers more of a "Retina Display" than its competitor. While both screens are protected by Corning Gorilla Glass, Samsung's flagship is a couple of steps ahead simply because it benefits from the latest iteration (Gorilla Glass 3). The SGS4 also boasts a display that can be operated while wearing gloves. All in all, the Samsung Galaxy S4 seems to be the clear winner. Nevertheless, Apple's displays are renowned for their accuracy in color reproduction. The Super AMOLED panel delivered by Samsung produces more vibrant and lively colors, but as pleasing to the eye as this may be, the color representation is not necessarily the most accurate. Despite the fact that, on paper, the iPhone 5 is somewhat disappointing in terms of CPU and RAM, it didn't stop the smartphone from going toe-to-toe with the Samsung Galaxy S3 in benchmarks. Apple's current flagship boasts an A6 dual-core CPU clocked at 1.3 GHz and 1 GB of RAM. Despite this apparent lack of processing power, the handset came in between the Snapdragon and Exynos-powered Galaxy S3 variants in terms of benchmark scores. Whether it is because of the operating system or the hardware architecture itself, the iPhone 5 delivers better results than the sum of its parts. 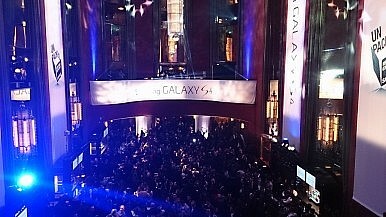 However, iPhone 5's hardware will not be enough to take on the Galaxy S4, as GeekBench 2 scores have recently suggested. Boasting a quad-core Snapdragon 600 CPU clocked at 1.9 GHz (in LTE enabled markets) and 2 GB of RAM, the SGS4 managed to yield 3163 points. That's almost double the score delivered by Apple's finest. Storage wise, both smartphones come with 16/32/64 GB, but the Galaxy S4 takes it one step further by having a microSD card slot. This can be used to expand the storage by up to an additional 64 GB. It is a well-known fact that iPhones, in general, shine in terms of camera quality, and the iPhone 5 is no exception. Samsung on the other hand delivered a decent camera on its previous high-end smartphones, but nothing ground breaking. Whether or not the situation will be any different this year remains to be seen, as the best way to compare two cameras is to thoroughly test them in the field, in various conditions. On paper however, the Galaxy S4 seems to have the upper hand. Its 13 MP sensor wins the "pixel war" against the iPhone's 8 MP shooter, but there's more to it than the amount of megapixels. The Galaxy S4 also features optical image stabilization (versus the iPhone's digital image stabilization), dual-video recording capabilities and a handful of other useful camera software features such as the Erase mode. Part two of the iPhone 5 vs Samsung Galaxy S4 miniseries will examine the software-side of these two gadgets. So far, however, the Galaxy S4 seems to have the upper hand in terms of hardware. This doesn't necessarily come as a surprise since the SGS4 is a much newer smartphone after all. What is your opinion? Share your thoughts in the comments section. Vlad Andrici is editor for gforgames.com and writes about technology issues. Samsung Galaxy S4 has the tech world talking. Can it take the crown from Apple and the iPhone 5? Smartphone Battle Royale: Samsung Galaxy S4 vs. iPhone 5, HTC One and the RestSamsung Galaxy S4: The Big DaySamsung Galaxy S4: What You Need to Know No Longer a Rumor: Samsung Galaxy S4 Set For March 14th ReleaseSamsung Galaxy S4: Release Date Pushed Back?